Like the two violent hurricanes that pound and swamp the city of Houston in the opening chapters, Flesh Eaters reads like a swirling wall of wind, debris, and water that knocks you to the ground and traps you there. Unable to escape, just pray that you’re safe. As the storms ultimately clear, something unnatural has spawned in the cesspool of sewage and pollution that is now a mostly submerged city. And that something wants to kill and eat. You. But how can you, when hundreds of square miles of your city are under water -- neck-deep in water moccasins, bloated corpses, unrecognizable poisonous goo, and cannibalistic undead? 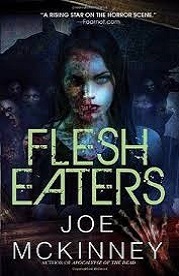 Flesh Eaters is Joe McKinney’s latest entry in his zombie series that began with Dead City and Apocalypse of the Dead. This volume is a prequel, and it tells the interwoven tale of two families struggling to survive in the deteriorating societal breakdown that exists after every mega-disaster weather event. Add to this mix one undead filovirus, and this world becomes a living (or not so living) hell. The principal story follows Eleanor Norton’s fight to save her family while also fulfilling her duty as an officer of Houston’s Emergency Operations Command. Eleanor is a strong-willed, well-rounded character and her personal challenges mirror the greater disaster that overwhelms her. She is a complex character that will have to dig deeper into her personal values and survival skills than she ever thought possible if she and her family are to survive. Her boss, Captain Mark Shaw is also trying to save his family while dealing with eighty thousand survivors trapped on high ground - an island of temporary safety in the middle of what is to become a war zone. Supposedly, help is coming, but like so many other disasters in recent history -- it’s too little, and much, much too late. Faced with an imminent catastrophe, Captain Shaw has to make life-and-death choices that directly affect his family and the thousands of civilians under his charge. Mr. McKinney brings his vast experience in Disaster Planning and Police Operations to flesh out this story and give it a truly haunting sense of reality. His writing is crisp, fast, and he seldom lets the characters (or readers) come up for air. The tension in Flesh Eaters builds naturally, and under Mr. McKinney’s firm authorial hand, there is plenty of gut-wrenching and ‘blow-their-heads-off’ horror as the outbreak happens. He turns the screw slowly, and we see how normal people must come to grips with world-shattering destruction. Ultimately, this is an apocalyptic story about families... one functional, one dysfunctional, and the choices that they make when the chips are down. Needless to say, not everyone makes it out alive. Flesh Eaters is an action-packed must-read. And without a spoiler alert, let’s just hope that Mr. McKinney has a sequel in mind for one of the survivors. Of course, that’s assuming there is one. (c) 2015 R. B. Payne. All Rights Reserved.